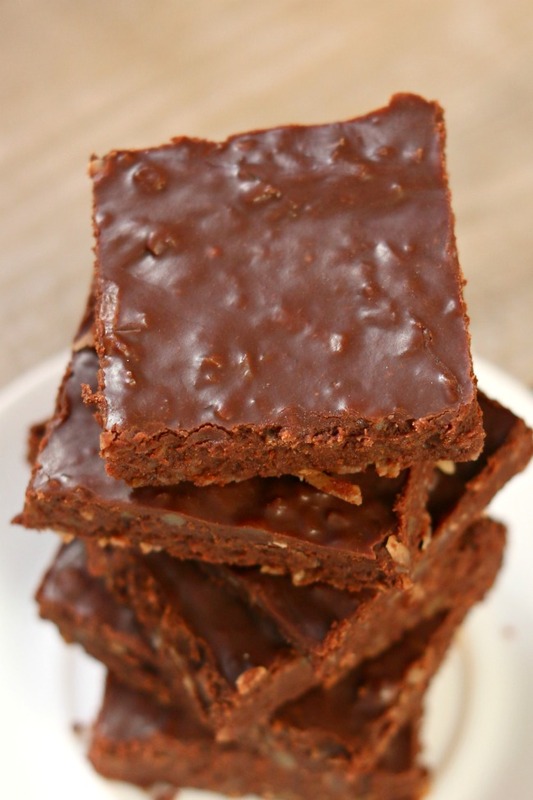 Slow Cooker 2-Ingredient Coconut Pecan Fudge–if you’re looking for a way to make fudge that is so super easy that your 5-year-old kid could make it, you’ve found it. With just two ingredients, chocolate chips and frosting, this fudge couldn’t be simpler to make. You’re probably wondering how someone could possibly make coconut pecan fudge with just two ingredients. I mean isn’t the coconut and the pecans two ingredients in and of themselves? Well I have a little secret for you. This recipe for slow cooker 2-ingredient coconut pecan fudge is made from semi-sweet chocolate chips and a tub of coconut pecan frosting. Really. That’s it. But does it taste like fudge? Yes! I was a little skeptical but it turned out fantastic and if I hadn’t known there was a can of frosting in the fudge I wouldn’t have guessed it. All you have to do is get a small slow cooker and put some chocolate chips in it (I like to use the Kirkland brand from Costco, Hershey’s Special Dark, Ghiradelli or Guittard) and then add the frosting and turn it on low. After about 30 minutes you’ll stir everything until it’s incorporated and spread into a parchment lined pan. I was hoping to use an 8 x 8 pan for this but it was being used so I ended up using a 9 x 13 pan. Then you’ll refrigerate for about 4 hours, or until the fudge is set, slice it up and serve. This is a great recipe for kids to make during the Christmas break! You can get creative with the combinations and flavors. I used the coconut pecan frosting but you could play around with the frosting flavors. I’m thinking rainbow chip frosting and white chocolate chips would be really fun. Or you could do mint chocolate chips with chocolate fudge frosting. The combinations are endless. And you can get creative with add-ins. You can add in pretzels, cranberries, pistachios, walnuts, coconut, marshmallows, mini m&ms, peanuts, etc. Peanut Butter Hot Chocolate–Bet you’ve never tried peanut butter in your hot chocolate! Dark Chocolate Peanut Clusters–Perfect for Christmas neighbor gifts. Chocolate Chip Cookie Bars–A unique way to bake cookies. Salted Caramel Hot Chocolate–I could drink this every day, it’s my favorite. For this recipe I really like to use a smaller slow cooker that cooks nice and low. I used my 3 quart Hamilton Beach slow cooker and it worked well. If you’re going to use a large 6-quart slow cooker for this recipe I would suggest just turning the slow cooker to warm instead of low. 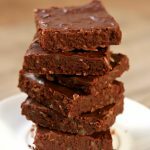 If you’re looking for a way to make fudge that is so super easy that your 5-year-old kid could make it, you’ve found it. With just two ingredients, chocolate chips and frosting, this fudge couldn’t be more simple to make. In a 3 quart slow cooker combine the chocolate chips and the frosting. Cover the slow cooker and turn to low. If you’re using a large slow cooker, then turn to warm. Cook for about 30 minutes. Remove lid and stir. If the chocolate chips are melted then it’s ready. Line an 8 x 8 glass dish with parchment paper. Scrape the chocolate mixture into the pan with a rubber scraper. Smooth the top. Refrigerate for about 4 hours, or until fudge is very well set. Slice into squares and serve. 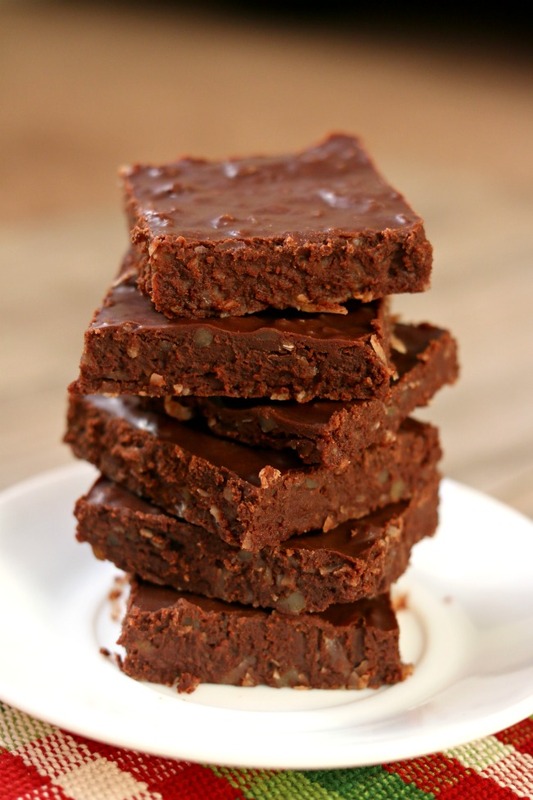 Save uneaten fudge in an airtight container in the fridge for up to a week (fat chance it will last that long). Instead of crockpot can I pop a bowl into the microwave? 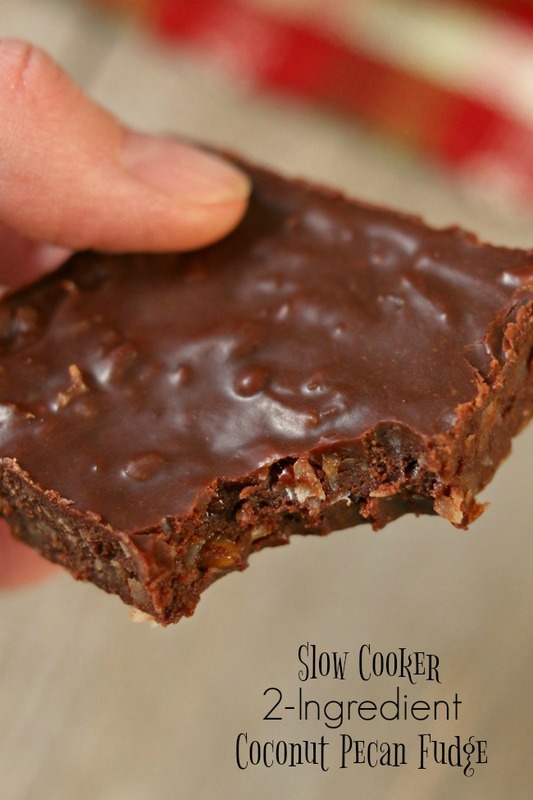 Easy to make and gluten-free treat? Count me in! My kids are getting a tasty surprise when they get home! Wow, my kids will love this very much. I will make this fudge today. Very nice and easy recipe. Thank you for your sharing, Karen :x.